When you are gearing up to surf, a good pair of surf booties is one of the most essential pieces of surf gear for any surfer out there. If you start to shop for a pair, then you will quickly discover that there is a lot of variety in terms of features and prices. And shopping for the best wetsuit booties for surfing can be overwhelming at first. To help you cut through some of those options, take a look at our top surf booties for 2018 to narrow down a pair for your next outing. And if you’ve never owned or worn a pair before, then take a look at our guide on how surf booties should fit at the bottom of this page before you start your shopping. It will help you get the proper size so that you have the safest experience out there. To learn more about our favorite options when it comes to the best wetsuit booties for surfers, just keep reading for our top picks or click the link above to see the full list of best selling surf booties right now. What’s the best surf booties for the money? Why do you need them? What factors do you need to consider when you are purchasing surf booties? This article will help you answer these questions. Why Do You Need Surf Booties? What Do You Need to Consider When Buying Surf Booties? Spring is coming up, bringing with it warmer temperatures. This means it is time to head for the beach. If you are a surfer, it is time to go out and purchase new gear to enhance your enjoyment and experience to the open waters. One item to consider if you are going to surf in colder waters is surf booties. The difference between a good pair and a bad pair will determine how your day on the waves will turn out. Let us show you some of our favorites. These surf boots are great because they have a lot to offer in terms of features and they also have a good price. I actually think that these are the best value surf booties for the money. They keep surfers’ feet warm while out in the water and they are very high quality and durable, which is why they are a good value. I love that these O’Neill surf booties have a durable rubber sole for good traction and double velcro straps. The straps are awesome because they ensure that you get the best fits from the boots, which means that you keep water out of the boots. So, no matter what temperature water you are in, your feet will be toasty warm in these booties. And, you will find that these last longer than the cheaper brands out there. 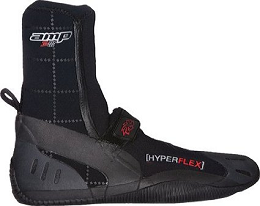 Despite being slightly more expensive than the O’Neill’s, I still think that these Hyperflex surf boots are a great option for surfers. They are well made and feature a hydro rib sole that gives you great traction when you are out there on your board. One of the things that I really like about this model is that you do not have to worry about having water logged boots because the hyperflex lockseal has an anti-flush closure that gives you a water tight seal every single time you put them on. These boots came out in 2010, but are still a top choice for surfers in 2017 due to the great design of these surf booties. The only negative with these is that they can be a bit difficult to get on and off due to their water-seal design. I find that a thin neoprene sock on under the boots makes them easier to slide on and off. I think you will find them to be very comfortable and the best Hyperflex boot series available for surfers. If you want a cold water bootie that is not quite as thick as the O’Neill or the Hyperflex, then this Rip Curl model is the best choice for you. 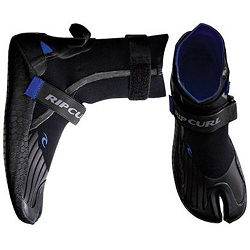 This Rip Curl surfing bootie is ultra lightweight and incredibly flexible. It actually feels almost like you are standing barefoot on the board when you wear these. The boots are easy to get on and off and will offer you a snug fit and durability that you can trust for many years. 100% (E2) Elastomax 2 Neoprene. Aqua Ban Liquid Taping. Ankle Flex Section and Tatex Flex Sections. Pull On tab for easy on and off. If you are relatively new to surfing and putting on a pair of these booties, then you may benefit from watching the video below. In the video, a fellow surfer gives some tips and tricks for the easiest way to pull on your wetsuit and booties in the parking lot before heading out into the water. What exactly are surf booties? According to Hawaii Activities, they are “thick socks that you wear out in the water to protect your feet from coral and sharp objects in the ocean.” To be exact, surf booties are made of rubber and helps you stay on and move around on the board. Surf booties can also be useful to keep a surfer’s feet warm when they hit the cold waters. Normally, they look like boots, but not always. Some of them look like normal light sneakers. Now, why do you need surf booties? 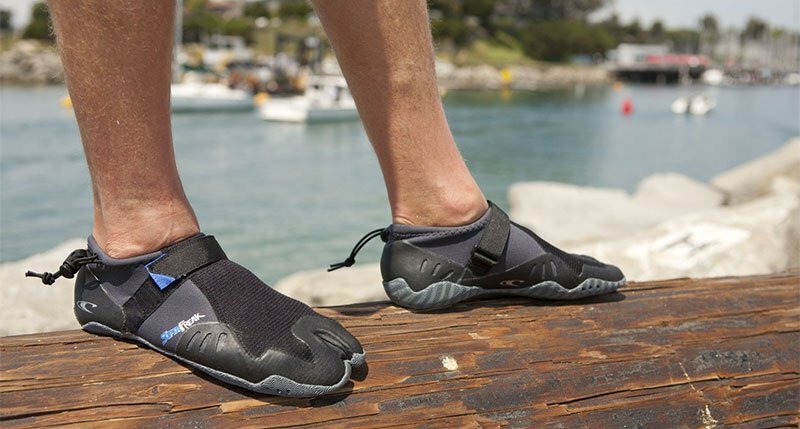 Aside from protecting your feet from sharp objects in the ocean, they will help keep your feet warm in colder waters. Believe it or not, some parts of the ocean can be around freezing temperatures. Falling off your board into that kind of water can be really awful for your body. Surf booties are recommended for waters around 40 to 60°F. But if you are in warmer waters like around Hawaii, surf booties can help you have a solid grip on the board and keep your balance. Returning back to sharp objects in the coral, surf booties are important to prevent cuts and nasty injuries that could ruin your nice surfing vacation. The coral reef may look pretty, but it can be deadly if you aren’t careful. Surf booties can prevent raising hospital bills and lawsuits from following close behind. There are a number of factors to consider where going out to make a purchase for your surf booties. Below we’ll go over what we think are the most important considerations for you to make before shopping for the best water booties for winter surfing or stand up paddle boarding. The first and most important is the size. Having the right size will determine comfort for your feet on your surfboard. However, finding the right size for your surf booties isn’t as easy as picking out regular shoes. First of all, the booties only come in whole size, no halves. Another thing to keep in mind according to the Surf Academy is that, “most surf boot manufacturers use different templates then a size 7 in one brand might feel like a size 8 in a rival brand”. Your best bet in that case is to try out different brands until you find the right one for you. 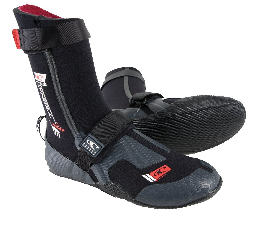 Here is a little trick to help you with the fitting of your surf booties: peel up the leg of your wetsuit put on the booties, and then roll the leg of your wetsuit back down over the surf bootie. This is will help determine if it won’t balloon up to twice their original size when in use or not. Another thing to think about for the size of your surf booties is you need to make sure there are no gaps between your foot and the bootie. If there is a tiny pocket of air present, water can get in and slosh around, making your bootie heavier on the surf board. Your best bet in that scenario is to have a tight size, but not tight enough to cut off your circulation. The tight size can provide extra support and strength. But, you do not want to cause discomfort on your feet in the process. One more thing about having tight surf booties is that that will not give with extended periods of use. They won’t and you will end up hating them in the long run. If you’re shopping for some wetsuit booties before you hit the waves, then you might need a little help when it comes to getting a proper fit.When buying surf booties, it is often difficult to determine what size you need for your feet. Like any other type of footwear, sizes run a bit different from one brand of surf booties to the next. The rule of thumb here is that you want a pair of surf booties that give a nice, snug fit around your ankles and feet. The trick is not getting a pair that are too tight. Basically, they should be tight on your foot but not so tight that you are losing circulation or causing your toes to curl up. Why do you need a tight fit from your surf booties? Because you do not want a lot of extra space where the booties can hold water and weigh you down. You also do not want your feet sliding around in the booties as that is not safe. What happens if your booties are too small? You will lose some circulation in your feet, which will be very uncomfortable and result in your feet getting cold rather quickly. You definitely do not want to have to end your time in the water early cause your feet are too cold as a result of booties that are too small. What happens of your booties are too big? You can trip easily and lose dexterity while on the board because you are working with large feet that you are used to standing on. And, the shoes will hold water and weigh you down so that you cannot move as quickly and easily. Plus, your feet can slide in the shoes and make you lose your balance before you know it. Also, all that extra water in the shoes will make your feet colder much faster. As you can see, getting a perfect fit from your surf booties is incredibly important. You should also know that surf booties do stretch and conform to your feet after multiple uses, so if you find a pair is just a little bit too tight then they might be perfect after a few wears. What if my foot is normally a half size? As you may already know, surf booties do not come in half sizes, which is why it can be difficult for so many surfers to find a good fitting pair of them. They also do not come in wide sizes, which means that people with wide feet usually have to move up a size. But, if your foot is a half size, you can move up a size and layer with a wool sock or thermal sock. This will not only help the booties fit you better, but will also give your feet a little more warmth when you’re out in the water. Another factor to think about when making your purchase for surf booties is the style that you want. Surf booties come in three styles: round toe, split toe, and latex dipped. Round toe around rounded at the toe as the name is suggested. These are the most popular style to buy. They are easy to make and really cheap. The round toe style is the easiest to be fitted. The split toe can be easily fitted for if you wanted to put a flip flop on over it. There is a split between the big toe and the rest of them. Because of this, they are much cooler than the round toe. Serious surfers and professionals love the split toe style because of performance. With this style, your feet are more like to stay on the board and not move around so much as it they would in a round toe style of bootie. With the round toe, your foot tends to round around inside, making energy transfer from your feet to the surfboard not so good. Latex dipped are booties made with neoprene and dipped in latex. The end result is really light and flexible. These booties may not be durable, but they are good in performance. The latex dripped style is the closet thing you will feel for surfing barefoot. But, don’t expect to be using them every time you go out to surf without having to replace them just about every year. One more factor to keep in mind when purchasing surf booties is the thickness. It is normal to have the thickest kind to help keep your feet warm and safe out on the waters. There three common sizes of thickness to surf booties: 3mm, 5mm, and 7mm. But how will you be able to determine how think you will need your surf booties to be? The answer depends on location. If you are going to surf in waters that are 4°C around places like Norway, go for 5mm to 7mm. If your plans are to surf in 8°C, 3mm to 5mm are your best bet. Good info. Thanks for the review Shawna!